Ethiopia aims to become a middle income country by 2025. It will achieve this goal through green growth, guided by its ambitious national Climate Resilient Green Economy Strategy. Bamboo is set to make a significant contribution by helping to drive local economic growth, reduce greenhouse gas emissions, restore degraded lands, and combat desertification. At COP21 during an INBAR consultation on a new ‘south-south-north’ partnership for bamboo development, Dr. Yigremachew Seyoum, Director, Forest Policy Strategy and Regulation at the Ethiopia Ministry of Environment, Forest and Climate Change, presented his country’s bamboo strategy and vision. He explained that bamboo is poised to add value to three important areas of the country’s national green growth plan, but cautioned that work is needed so the plant can be used effectively as an economic and environmental development tool. Dr. Yigremachew Seyoum, Director, Forest Policy Strategy and Regulation, Ethiopia Ministry of Environment, Forest and Climate Change. Ethiopia’s strategy targets green growth for improved crop and livestock production for food security, income and reduced emissions; protecting and re-establishing forests for economic and ecosystem services; and renewable electricity for transport, industry and buildings. 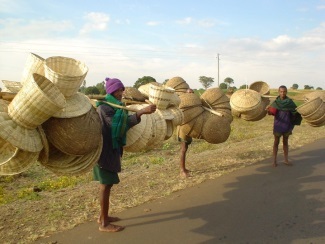 Ethiopia’s bamboo resources can make an important contribution to each of these targets. Bamboo is a significant economic and environmental resource for Ethiopia and today its full potential is not tapped, explains Dr Seyoum. The country has indigenous bamboo forests of some one million hectares, nearly 70 percent of Africa’s resources and seven percent globally. But, recent studies suggest that this stock has been significantly reduced over the past 20 years, a situation that is currently being verified. Dr. Seyoum cites several reasons why the use of the country’s bamboo resources is below its potential. “The supply of available raw bamboo is diminishing; most activities today are in primary processing, and the bamboo industry needs to evolve so it produces value-added products. Also, the bamboo sector needs the support of a robust policy framework – ranging from managing bamboo forest resources to business and market development. This is where we need to encourage investment and the expansion of bamboo industries – both locally and nationally,” he explained. Ethiopia is addressing these issues today in its ‘Bamboo Sectoral Strategy Framework’ and ‘Bamboo Strategy 2013-2015.’ The new south-south-north partnership announced this week to transfer bamboo business know-how to Ethiopia from Chinese and Dutch experts will bring new inputs to the country’s bamboo development. 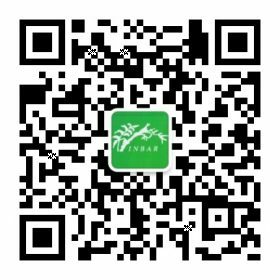 It will share practical information on enterprise development, value-added production, policy frameworks, and standards. This six year old lowland bamboo plant has 94 culms per clump. 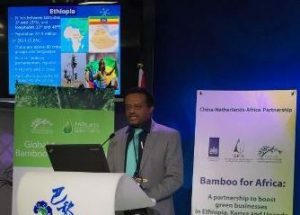 In addition to increasing business know-how, Ethiopia needs to bridge a knowledge and information gap in the assessment and understanding of its current bamboo resource base, says Dr. Seyoum. Here, specific questions are: where is the bamboo? How much is there, and how can it best be maintained and expanded? “We need better information to inform all aspects of local value bamboo chains, such as local practices and traditional knowledge, and stand management techniques. This includes large-scale bamboo regeneration, propagation and processing, packing, storage, and grading,” he explains. The country lacks a database on the types and characteristics of bamboo for sharing practical information, he says. Working with GABAR, the Global Assessment of Bamboo and Rattan, will help Ethiopia capture and share its knowledge and open the sharing of expertise with other bamboo resource countries. Dr Seyoum explains that the pathway to bamboo development is clear. A clear national strategy for conservation, development and utilization of Bamboo is needed, as is more promotion of bamboo use for environmental services such as green landscapes, carbon sequestration, soil protection, and wildlife conservation. On the business side, financial and technical investment in bamboo-based industries will drive the creation of businesses and markets for bamboo charcoal fuel, pulp, and paper. Many village workshops produce bamboo goods of interest to urban consumers. But access to markets is notoriously difficult, hampering business progress. The country also has a small but growing bamboo industry and a community of local entrepreneurs whose factories produce bamboo products such as bamboo poles for construction, fiber and pulp for cellulose, flooring, window blinds, charcoal, and some industrial products. At village level, there is also a cottage industry of local workshops making handicrafts, small household goods, and related items in the Awi zone, Southern Nations region and Addis Ababa that are of interest to urban consumers. But income options are hampered by difficult access to markets. The potential is there, says Dr Seyoum, but markets need to be better organized and accessible, and business needs to be energized. He sees a comprehensive national bamboo plan as the pathway to more bamboo prosperity for people and communities. 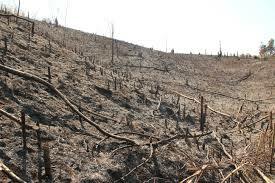 National land restoration programmes specify bamboo to restore degraded or sloping lands across the country. Further national action plans should drive development and encourage investment in environmental services and industrial development. Bamboo brings environmental benefits for carbon sequestration, landscape regeneration and soil and fauna conservation. Industrial development – both local and large scale – needs financial and technical investment in bamboo-based industries. Here the target is charcoal, pulp and paper and bamboo-based biofuel. The next steps for COP21 as countries plan their post-2020 climate change plans will be a plus for building Ethiopia’s bamboo sector. With its sold green credentials for environment and economy, bamboo will be able to attract finds and investment as part of the national climate change agenda.